Today, I froze. Well, not literally froze, but you know what I mean. It was -32 degrees this morning, and we had some outdoor work to do, some of it on a roof, and despite the fine clothing, boots, gloves and toque, I froze all the same. I am finding that as I age, I am less able to handle these extreme cold days. In my youth it was a time to go out and play hockey and skate and ski and throw snowballs, make forts, then come in and warm up with hot chocolate. As a worker….not so much. The fun has been sucked out of my winter love. As I drove home, I spoke to my wife over the hands-free phone, and lamented the cold. I told her ‘I’m ready to accept that job as greeter at the Orlando Walmart’. She and I laughed, but mine was an empty laugh. Had someone called and offered this job for real, I would likely have accepted with very little coaxing. I drew closer to our home, alone in my thoughts, listening to some loud music but not actually hearing it. Daydreaming of a lottery win or some long-lost wealthy uncle who bequeathed millions to me, enabling me to take my family to some place warm….just for a while. I parked my truck. I got out. I slowly trudged my way towards the door. And then I saw with my tired eyes before me one of the many reasons that I am happy to be alive. The sun was sparkling upon our River House, and shining down on our trees and garage and frozen river. The snow, freshly fallen in the last two days and un-sullied, was brilliant and white and soft. 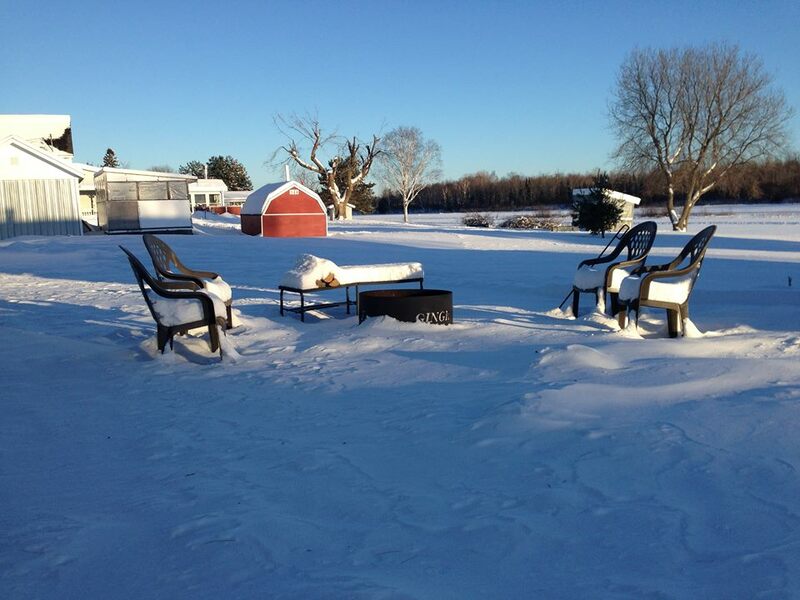 And there was our fire pit, four chair arrayed around it, covered as the round was in fresh powder. Slumbering in the sun, awaiting us to build the nerve to dust it off and light it, to awaken it for but a few hours. Today was not the day to do so. Perhaps the next weekend. But it warmed me just the same. It once again reminded me that the only time our corporeal life is over is when it’s over. Until then, rain or shine, warm or cold, we get to breathe, we get to love and are allowed to enjoy things come what may. Live, and earn your urn…..don’t wait for it to come, because inevitably it will. It was a good day to be alive….again. To be Canadian, we accept the weather for what it is. When it’s great weather, we live it up…and when it’s not so nice…we remember the days of summer. That is the full cup measure…and it is the positive cup too. Enjoy…this too shall pass.